This week we we zoom in on the subject of nano-particles to examine how tiny objects, smaller than the wavelength of light, can be making such large waves in the fields of health, optics, and electronics. Plus news of purple tomatoes on their way to your dinner plates, the medical treatment that could mean the end of peanut allergies, the acid dip that reverts cells to their stem state, and what's in the air in Beijing? Cells can be switched back into a stem-cell like state by giving them a brief shock with acid, Japanese scientists have shown. Previously, Nobel Prize-winner Shinya Yamanaka had found that adding four specific molecules to cells could reprogramme them. Now, for the first time, writing in the journal Nature, they've shown that a physical shock - like acid - can switch cells into a stem cell state. So it's fascinating and potentially very important for future stem cell therapies, not to mention a little bit controversial as it sounds almost too good to be true. To make their discovery, the researchers took white blood cells from a mouse spleen, and gave them a 25 minute dip in acid at pH 5.7 - normal body pH is around 7.4. They then grew the shocked cells in the lab and found that they took on the characteristics of stem cells. The team found they could push these reprogrammed cells into making different kinds of tissue found in the early embryo. They also showed that other types of cells, including nerve cells, skin, muscle fat and bone could also be reprogrammed with an acid dip. 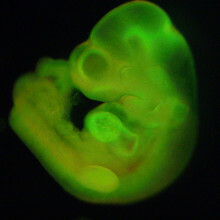 In further experiments, the researchers showed that their acid-induced stem cells could make up tissues in both a mouse embryo and the placenta. This is very unusual, as regular embryonic stem cells can only contribute to the embryo, and not to placenta. It's easy to imagine that this kind of reprogramming could have huge implications for making stem cells for uses such as growing replacement organs - and certainly the headline writers have been very excited. But there are a lot of questions. Firstly, this is just from one lab, so the remarkable findings need to be reproduced by other teams. Also, we don't know if it will work in human cells, or if adult cells can be reprogrammed in this way - something that would be most useful for medical applications. Any stem cells generated by the acid bath method would still have to undergo extremely rigorous testing to make sure they stick to what they're meant to be doing and don't become cancerous. It's also not clear how 'normal' they are in terms of the molecular markers that control gene activity, known as epigenetic marks. And there's a bigger question about how it works and why, for example, cells in the very acidic environment of the stomach don't get reprogrammed. What microbes cause the Beijing cough and how do they travel through the city’s thick smogs? Mark - Yeah, that's right. Have you ever been to Beijing, Chris? Chris - I have. I went in 1999 and I was gobsmacked by the amount of traffic and the number of bicycles on the road. But I've got a very nice picture of myself at the emperor's Summer Palace, looking across the lake to the mountains, the artificial mountains they've built for him in the background, and you can see them very clearly. At the time of the Olympics , someone posted a near identical picture on the internet and that view that I had had, in 1999, was completely obscured. They said that's down to pollution. Mark - It is. 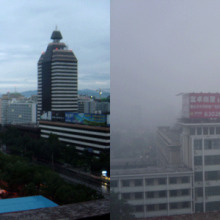 Beijing has a huge air pollution problem. Mostly from the tiny particles that are generated from burning coal and the number of cars on the road as well. So, that's a known public health problem, but there's a lot less known about the impact or even the identity of the microbes that are also drifting through that brown haze and these particular smogs that you get. So, Chinese researchers now use genome sequencing to sample the air and they've identified about 1300 different bacteria that were floating around in a particularly soupy smog back in January last year. Chris - Okay, but how does that compare with - if I just took some London air or some (heaven forbid) Cambridge air on a day like today and do a similar genome analysis because just because they're there, it doesn't mean that they're either pathological or that they're there in a threshold amount that can do damage? Mark - You're absolutely right. We live in a sort of microbial soup all the time. Researchers have done some similar genome surveys. It's called metagenomics. Genome surveys of air in a New York subway and in Milan for example. But previously, we haven't really had the technical ability to drill down to identify particular species. What you tend to be able to do is to identify sort of the presence of members of a broad family of bacteria. But of course, the pathogenicity of different members of that family varies quite a lot. Now, what they've done here in Beijing is actually drill down and identify individual types of bacteria, species of bacteria. Most of them are benign, but a few of them are responsible for allergies and respiratory diseases in humans - Streptococcus pneumonia for example was in there and Aspergillus fumigatus which is a fungal allergen. Importantly, what they found was that the amount of DNA from these species actually increased 2 to 4 times on the smoggiest days. So, there's this hypothesis now that on the smoggiest days, you're not only getting exposure to more particles, but potentially, more exposure to pathogens and allergens. Chris - Of course, people have in the past related bad air days to bad allergy, bad respiratory, and bad heart attack days. There's a very connection and previously, people have implicated nanoparticles in the air from engines and things. So, do you think that the bugs are possibly playing a role as well? Mark - Well, when I was writing this story this week, I spoke to one researcher in Milan actually who said that there's this growing sense actually that bacteria are playing a really important role in these adverse health effects of airborne particles. There's this growing sense that perhaps bacteria are one of the key factors in causing health problems. - Genetic modification allows scientists to select genes which code for certain beneficial traits from one organism, and add then them to another. - It is similar to, but much faster than, the traditional practice of cross breeding certain plants to improve a farmer's harvest. 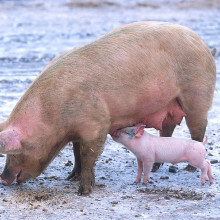 - Some people worry that GM food is 'not natural' and therefore not safe, but no studies have yet found this to be true. - Over a million children a year in developing countries die because of Vitamin A deficiency, with many more being left blind. - Golden rice could help prevent this, but regulations and fears about its safety have delayed its introduction. - Mice with cancer fed these tomatoes lived 30% longer than those fed on normal, red tomatoes, and they may also have anti-inflammatory properties. - But, UK regulations mean the tomatoes have to be grown in Canada, where regulations test the safety of the food as it will be eaten, not the process of developing it. - The seedless juice can then be shipped back to the UK for trials. Because it is seedless there is no risk of the plant escaping into the wild, so it bypasses British regulations. 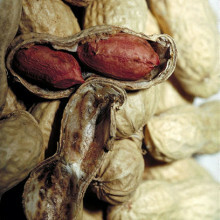 About 1 in 100 in the UK has a peanut allergy. But this week, researchers announced a new technique to control the allergy. About 1 in 100 in the UK has a peanut allergy and it can have a huge impact on the lives of those who are affected. But this week, researchers at Addenbrooke's Hospital in Cambridge announced the success rate of 84% using a new technique to control the allergy. Ginny Smith went to the hospital to meet some of the study participants and Dr. Andy Clark who's one of the lead researchers on the project. Andy - Well, it's a really big problem for us and the population. There are probably half million people in the UK who have peanut allergy. Every year, despite our best efforts, deaths still occur. The difficulty is we don't know in whom those deaths are going to occur. So, children in the past who have had mild reactions have gone on to die from peanut allergy. So, it's really important that this is recognised and it actually drives down the quality of life of people who have peanut allergy. So, it's a really important issue to address. Ginny - With peanut allergy such a big problem, Andy and his colleagues put together a trial to see if they could cure it. I spoke to 11-year-old Lena who took part in the trial to find out what it involved. Lena - I had to eat 2mg of peanut to start with and it kept doubling every 2 weeks so I had to come back to the hospital every 2 weeks. Ginny - And now, how many peanuts can you eat? Lena - I'm allowed up to 12.5 a day, but I don't really like them. So, I have to eat 5. Diana - I'm Diana Bardon. I'm Lena's mum. Ginny - What did you think when you heard about this trial? Diana - Well, I heard about it a couple of years before Lena joined. We've been under Dr. Clark since Lena was 2, so quite a long time and I was quite excited about it. I asked him about it, but Lena was a bit young to start off with so we waited a year or two until she was old enough really to understand herself, what she would need to do every day. Ginny - What was it like having a child where you had to be so careful not to let her eat peanuts? Diana - Well, I wasn't used to this at all. I've come from a family where we've never had any allergies or asthma, eczema, anything at all. So, it was completely alien to me, plus the fact that I'm half American. So, I was weaned on peanut butter. So, not being allowed to have peanuts in the house was - I just couldn't believe that this was happening really. Andy - So we used something that sounds quite intuitive. We gave them a little bit of what they're allergic to to try and induce tolerance to it in the long term. We gave them a very small amount of peanut and gradually increased it, giving them doses every day, but increasing the amount every 2 weeks. Ginny - When you say a tiny amount, are we talking one peanut or less? Andy - Much less. So, we gave 2 mg of peanut protein. Ginny - How many milligrams of this peanut protein would you get in a whole peanut? Andy - Sure, that's about 150 mg in an average peanut, but of course, it varies. Ginny - So, we're talking a 1/70 of a peanut. Andy - Yes, about that and it's such a small amount as I say it doesn't cause problems. Ginny - When you say administered it, were they eating this tiny bit of peanut? Was it on the skin? Andy - Yeah, we measured that out into these tiny doses which increased over time, but each time the child took it, it would be mixed into something that they could take like yogurt or a milkshake. And also, that was used to disguise the taste. So, every 2 weeks, we increase the amount. We roughly double it. So, by the end of 3 or 4 months, they're actually eating whole peanuts in large amounts. So, what we found was over time, the children's tolerance increased so that they would react or have minor reactions to the lower doses. But as we increase the doses, they became more tolerant. So eventually, in the study, 84% of the children could eat the equivalent of 5 peanuts every day without having reactions. Ginny - When you say they did react a bit to these lower doses, I'm assuming that wasn't full on anaphylaxis. Andy - That's right. So, mild reactions were quite common. Pretty much, everyone had a bit of mouth-itching with some of the doses. Only one of our participants had a more severe reaction which was treated with adrenaline and we withdrew him from the study. Ginny - Why do we think this is happening? Andy - Well, we did some mechanistic work and we looked at the very top level of the immune system where we expect this to be working at cells called basophiles. We found that the basophiles became less sensitive to peanut exposure over time. Now, what's going to be really interesting in the future is to investigate that further and find out what the triggers and switches are for basophil control. 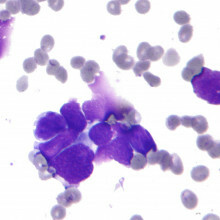 Surprisingly, little is known about these really interesting immune cells. Ginny - What would they be doing normally in someone who didn't have an allergy? What are they for? Andy - Well, they are a sort of evolutionary hangover from when we used to be colonised with parasites, but we don't need them anymore. It seems that they're becoming distracted with every day proteins that we come across. Ginny - What do you think the biggest thing is that's changed about your life since you've done this trial? Lena - I'm allowed much more stuff that says, say for example, with like food labelling that say, "May contain traces of peanuts" so some more chocolate and stuff. Ginny - That sounds good. So before, you have to be really careful with what kinds of chocolate you ate. Leina - Yeah. We had to read every single label, absolutely everything. Ginny - So, is this something that's likely to work for other allergies, perhaps ones that are a bit less severe, but affect a lot of us like hay fever? Andy - Yes. In fact, there are licensed NHS products now for hay fever and venom allergy. It's also used in the NHS for treating house dust mite allergy and pet allergy. Ginny - Is this something that in a way, people might have sort of been doing by accident themselves? I know some people find their hay fever's really bad at the beginning of a season, but by the end of it, it sort of seems like it's a bit more under control. Could that be related to this? Andy - We certainly see that in cat allergy, so, people who are allergic to cats and have hay fever symptoms when they're near their cats get used to it over time. Then we see students for example lose tolerance to their cats when they leave home to go to university and then come back during holiday time, and they get worse symptoms again. DNA from modern humans and Neanderthals reveals ancient interbreeding of the two species. As the success of family history TV programmes shows, we seem to be endlessly fascinated with our ancestors. But tracing your great-great-great-great aunt is nothing compared to what scientists have announced this week. A pair of papers published in the journals Science and Nature, looks at how our Neanderthal ancestors have left genetic traces in our genomes today. Modern humans, Homo sapiens, and Neanderthals split apart in Africa more than half a million years ago. But while humans stayed in Africa, Neanderthals went off to explore Europe and Asia. When we finally left Africa less than 100,000 years ago, there's good evidence that these early adventurers interbred with the Neanderthals living between Western Europe and Siberia. Comparing DNA from Neanderthal bones with our own tells us that around 2 per cent of the genomes of people descended from non-African populations is Neanderthal. 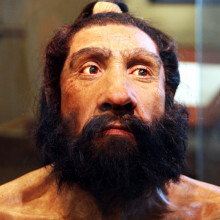 The Neanderthal genes are scattered across the genome, and different people have different ones. Previous research has pinned down a few of these, for example genes involved in responding to infections or UV radiation from the sun. Now the new research, from two separate teams of researchers in the US, has looked at much larger parts of the modern human genome that probably came from our Neanderthal cousins, who died out around 30,000 years ago. The scientists used computer programmes to pinpoint sequences in our modern DNA that looked like they were much older, and compared them with the Neanderthal genome to pick out regions that probably came from them. One team of researchers found about one-fifth of the Neanderthal genome spread across the genomes of more than 600 currently-living Europeans and East Asians, while the others put together about 40% of the Neanderthal genome from the DNA of more than a thousand living people. The data shows that while this interbreeding may have given our human ancestors useful genes for coping with the cold of northern Europe, the downside was that the Neanderthal/human hybrids probably had fertility problems. There's also evidence that Neanderthals gave us gene variations linked to certain diseases, including type 2 diabetes, and depression, as well as immune system-related diseases such as lupus, biliary cirrhosis and Crohn's disease. Curiously, the scientists also found that Neanderthals gave us smoking addiction, although this gene is probably involved in some other biological process, as there's no evidence at all that they liked to light up a cigarette in their caves. Some genes are found in humans and not Neanderthals. One intriguing example is the gene FOXP2, involved in speech and language, which is in our DNA today but doesn't seem to exist at all in the Neanderthal genome. There are also big chunks of the Neanderthal genome that are nowhere to be seen in our modern human DNA, suggesting these genes were harmful for us. So far, the researchers have only looked at comparisons with Neanderthals and modern humans from populations that came out of Africa. But it would be interesting to look more closely at the genomes of modern Africans, as well as people all over the globe, to see if there's any more evidence of interbreeding with long-extinct populations way back in our family trees. Microbes living on sea sponges produce a host of potent drugs, scientists have discovered. Sponges are regarded as a rich source of potential new drugs, ranging from antibiotics to anti-cancer therapies. But the concentrations of these agents are tiny, meaning that preclusively large numbers of sponges would need to be harvested to yield useful drug quantities, and exactly why and how these marine animals should make such a broad repertoire of chemicals wasn't understood. Also hard to explain was the observation that sponges living in different environments produced very different profiles of chemicals. Now, a research team at Bonn University have solved the puzzle with the discovery of a bacterium called Entotheonella palauensis, which lives on and in the sponge and appears to be the source of the observed chemical wizardry. Writing in Nature, Michael Wilson and his colleagues collected and broke up sponges to produce a "sponge soup", which was added in small amounts to individual culture dishes. Growing within some of the cultures, the team found long filament-like chains of bacterial cells, joined end to end and resembling strings of bricks. DNA extracted from the micro-organisms showed that they were endowed with genes capable of producing a broad repertoire of biological molecules, including some of the therapeutic chemicals previously isolated from sponges. Tests on the microbes confirmed that they were indeed producing these substances. 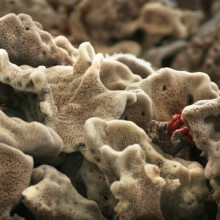 Finding these bugs in one species of sponge doesn't prove the rule though, so the researchers also analysed a further 37 sponge species from a range of geographies, of which the bacteria from 28 of them were up to 99.9% genetically matched with the Entotheonella palauensis bugs the team had been working on. At the Nanophotonics centre at Cambridge University a team of researchers are using this technology to developing new materials including a polymer which changes colour as it stretches. Kate Lamble spoke to the head of the centre, Jeremy Baumberg. 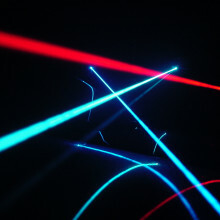 Jeremy - So, nanophotonics is a way of trying to control light in a new way. Nano are sort of small things and nanoscale is something on the scale of maybe tens of atoms, hundreds of atoms. It's a billionth of a metre, but it's also a way of trying to build things on that length scale so that we actually change the way that light interacts with matter. Most of the clothes that we're wearing, they're coloured, but the reason they're coloured is that they've got molecules in them and when we shine light on them, some of the electrons in those molecules absorb particular colours of light. We see the rest of the colours of light coming out. So, the idea of nanophotonics is, can we design materials where they have this really intricate architecture on a really small scale, which is smaller than the wavelength of light to change the colour of the material. Kate - So in nature, what animals or what plants do use colour in a different way from how we use it? 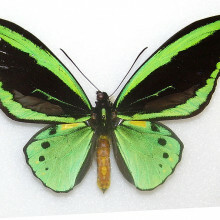 Jeremy - So, the classic example is a butterfly. So, in nature, it's really difficult to make a good blue colour and you can actually see that from blue M&Ms or Smartie's where they've actually tried taking out some of the artificial dyes and put in natural ones, and they're really poorly coloured. So butterflies solve this problem not by using a dye, but often by actually having really intricate wing scale structures. What they do is they scatter blue light very strongly, but absorb the other light. So, only blue light comes off and you have this wonderful iridescence. You can also see it in plants. That's actually the cellulose in the plant walls which is spiralling in a certain way and that generates colour in the same way. We're just about to start working on squid and clams, and they also have very strong iridescent colours which they generate by layers of proteins in their cells. Kate - We were talking earlier about the colour of our clothes. I'm wearing this really bright pink jumper today, but that's all wool. I suppose when we're looking at the structure and imitating the structure of nature, we have to look at different materials rather than the ones that we're used to. Jeremy - So sometimes, we actually do use the materials that's in nature. As I was talking about, cellulose is just wood pulp. But often, we're trying to use materials which we control and produce very simply so often polymer materials. So, I have in front of me a piece of a material that we've been playing with for the last 5 years or so and that's actually made of spheres of a polymer which is polystyrene. So basically plastic bags. What happens here is if you take a sheet of this material, it's transparent. But if you chop it up finer and finer, it starts to get a colour and what makes it really work is we make tiny spheres of this, less than the wavelength of light. We've learned how to make them so they stack up in regular arrays. When they stack up, they make wonderful iridescent colours. So, this piece here is a wonderful bright green. The nice thing is, because it's made out of an elastic material, when I stretch it, it changes colour because I'm changing the separation of all the different components. Kate - This material is amazing. I mean, holding it just in your hand, it looks a bit like the back of a beetle, that iridescent shine that you get in a back of a beetle. But when you stretch it, it goes from a green to a definite blue. Why does that happen? Jeremy - So, what happens here is that we have balls, all sitting in regular sheets. So, imagine you're taking marbles and putting them in a tray. We have a whole set of the balls like that and then another layer on top, and another on top of that. The light bounces against these stacks of spheres and when it bounces against each layer, there's a small amount of the light that's actually scattered in different directions. When you add up all the waves from the light reflecting at different interfaces, only for some colours do they add up constructively, do they add up to make a strong amount of light coming off. It's a bit like the phenomenon of waves. You can see waves bouncing around near the shore of a sea and when the wave patterns come together, you get these patterns of crests and troughs. That's happening with light here. What we have to do is we have to get the spacing of these layers exactly right. So what we can do is we can change the colour of the material just by changing the size of the spheres. We can make red ones or blue ones or green ones, just by starting with different sizes of the spheres. Kate - And how did you go about making these spheres and working with them on such a tiny level? Jeremy - This is in some ways a really simple material, but until now, it's been incredibly difficult to make and it's actually an opal. So, this stacking of spheres is what you find happens in the ground in Australia. It takes 5 million years, high pressure, and special water to do it, and we don't have the time for that. So, what we do is we actually grow these particles. You start by seeding them and then you throw in some chemicals which are called monomers. What you do is you grow a chemical reaction so they actually come stick on the seeds. And you throw in more monomers and they grow more and more, and more. Each seed grows at the same rate and you can stop at any point, and then you've got a whole load of spheres all the same size. So, when you do that and we make a sphere which is maybe a quarter of the wavelength of light across, a couple of hundred nanometres. and then we graft onto to edge of it, we add on a sticky layer - it's like chewing gum. So, what we end up with is all of our spheres are coated with chewing gum and then we dry everything out. Then what we can do is if we heat that up a bit and we sheer it which is, we actually put it between our hands if you like and move our hands in opposite directions then these spheres have to move over each other. It turns out, when they have this chewing gum coating, as they move over each other, they start to like to form a really regular lattice. So, it's a self-assembly process and that's the secret of what we're trying to do, instead of putting every sphere where we want it. We want all the spheres to go to the right place. Kate - How long has this sort of work been possible? How long has it been that we've been able to get down to the scale of nanometres and work on this level? Jeremy - So, it's been evolving over the last 20 years or so and what we've been learning steadily over that time are different little tools and techniques. In that time, what's happened is with these building blocks, we've learned how to grow much better. But actually, how to glue them together, we're still only slowly learning. Kate - If it's only been around for 20 years and yet, we've got so far in that considerably short period of time, in another 20 years, where do you think it will be and sort of, do you think these type of nanophotonic materials will be in our everyday lives and we'll be taking them for granted? Jeremy - Completely so. I think the first place they'll come in is in the sort of areas of sensing and health. So, we're starting to learn ways that we can make materials that might respond to thousands and thousands of components that are in our immune systems. So, you get some sort of optical readout. We'll definitely see that within 10 years. I also think we'll start to see materials on buildings where you can change colours. There's a big demand for doing that. Certainly textiles, people are very interested in smart textiles. So, all of this, in the next 20 years, I think will become very, very mainstream. So Jeremy Baumberg of the Cambridge Nanophotonics Centre predicted that nanophotonics will become mainstream in medicine within the next decade. Perhaps one of the applications will be a system being developed by Nottingham University's Cameron Alexander, to deliver and activate nanoparticles in specific cells and tissues, he spoke to Chris Smith. Chris - First of all Cameron, what actually is a nanoparticle? Cameron - Well, nanoparticles essentially are any particles that fit in a size range less than a micron. So, that's something where you can have a thousand microns in a millimetre. But it's also important to remember that nanoparticles are actually bigger than atoms. So, whilst they're very small, they're actually rather bigger than atoms. But they could be anything essentially on that size range. Chris - What are you trying to do with them? What's the problem you're trying to solve? Cameron - So, what we're trying to do with our nanoparticles, we've devised a system where we put together nanoparticles with long chain molecules called polymers similar to the ones that Jeremy talked about. But we attach those to strings of DNA or nucleic acids which have a sequence of bases and letters so that they encode for a particular sequence. What we do, or the idea is that we can then use that code to recognise a target molecule inside a cell. The idea behind that is that that target molecule which could be something related to a disease, a gene signal from a disease could then open up a nanoparticle and release either a cargo or which could be a therapeutic drug molecule, or a signal which might be an optical readout or some other response. So you can then use this as a combined sensor and diagnostic. But also, perhaps a therapeutic at the same time. Chris - So, we have these tiny particles, they have a cargo in the centre and wrapped around them is some DNA. You're not using the DNA as a genetic material, but you're using the DNA because it has a specific structure and a sequence, almost like an address. It can sense if there's another piece of genetic material in the cell the particles goes in to. If the two recognise each other, this makes the particle do something. Cameron - That's right, yes. We're using the DNA as a code. If you like, a bar code, such that one can have a very specific signal which addresses that particular code. What we do at the moment, we haven't actually put drugs in the core of these things, but we stuck the DNA with cholesterol at one end, so an oily molecule. That causes these long chains to associate together. So, there's an oily water hating core, and then the DNA strands stick out from that and on top of that, we put a covering layer which hides one of the signals and only when a specific target molecule either in the cell or in the test tube as we've shown, when that comes in and binds to the other bits of DNA, this opens up the surface of this nanoparticle, revealing a signal or a hook in our case which you can then have a readout. But of course, one could do that to release a specific drug molecule at an exact place in a cell. Chris - So, what sorts of signals are they responding to? How is that unlocking process happening and how could you make it specific for a certain type of cell or a certain type of disease? Cameron - Well, there's a number of ways you can do this. What you can do is you can have, if you like, a little hook on these nanoparticles which is exposed to bind to a specific cell. So, particular cells and cancer cells are very obvious examples. Sometimes what they do is they produce molecules on their surface and there are more of those molecules, sometimes there's are particular what's known as receptors which bind to particular components on these nanoparticles. Those receptors are some times more prevalent in cancer cells. They're a signal of the cancer cell. And so, of course, we could put those markers on our nanoparticles to trigger their entry into a cancer cell to deliver a drug specifically to a cancer cell rather than a normal cell. Chris - Can they be safely injected into the bloodstream anyway, these particles? Cameron - We've not done that with these particular particles, but there are plenty of other examples of similar based systems where they have been injected safely and they circulate for a long time. So, there's no reason to suspect that these would be in any way detrimental. Chris - If they're not wanted in a cell, then what happens if they don't open up? Cameron - If they don't open up, these things would be passive and harmless and they can be excreted. So of course, what one can do is, make them out of natural components which degrade over time anyway, so they're filtered out by the kidneys. So, there are ways in which you can build them from components which will degrade naturally over time. So, you have plenty of flexibility and this is the advantage of using these polymer molecules, is that you can flexibility in the design to make them respond to the signal that you want, to degrade over the time that you want. Chris - And is it likely you could package pretty much anything inside your nanoparticle or are there certain things which you just can't put in there? Cameron - In principle, you could package pretty well anything based on the kinds of chemistries. But of course, as we go back to the concept of nanoparticle size, I think that's something that's important to remember because whilst these things are bigger than drugs molecules, so you could put a conventional drug molecules in. You couldn't for instance put in a huge number of drug molecules. There are only a certain amount of space in the core of these systems. Of course, if you want a cancer therapeutic - you want a very potent drug in the inside. Of course, there are other things which are simply too big to fit in. Chris - If you could address them to specific tissues, apart from just labelling up the tissue to tell, doctors or scientists, "Look. This particle's homed in on this part of the body." I presume that means you could direct a drug just to that place which spares the rest of the body being exposed to it - which would reduce side effects. Cameron - Exactly, that's one of the key things obviously in cancer therapies, but in the other therapies as well where you want to take your drug molecules to the very specific target - either the cell itself or something inside a cell - a specific location, and therefore, not expose the rest of the body to this. So, that's a very, very key thing in cancer therapy, but in other diseases too. Chris - And the killer "T" question, "Time", how long do you think because I think people often find it difficult to understand research timescales. You're at the stage where you're doing this in a test tube. How long do you think it'll be before you've got something you could be putting into a patient? Cameron - I think realistically, the kind of things where you develop the materials, you're looking at the kind of five year timescale whether you've established safety. Whether you've actually got something which is fully efficacious may take a little bit longer, but obviously, I'm hedging my bets on the answer because these things can always take time. But I think the chemistries are there to make these materials. The question is, cost and of course, if something else comes along in the time which is better than what we've got at the moment. Kat Arney - I just had a really, really quick question for Cameron. It's that I've heard that cancer cells tend to really like taking up nanoparticles. Is that true and do we know why? Cameron - Yeah, there are some cases that nanoparticles can target cancer cells and essentially, cancer tissue is slightly more disrupted than normal tissue. So, slightly bigger things like nanoparticles can actually go into the gaps between the cells. They're not pumped out quite so quickly. So that's why they can potentially target cancer cells in general. Kat - Because there's lots of excitement about nanoparticle therapies for cancer and it does seem quite a useful property that they do like them. Cameron - Yes, indeed. Again of course, they can carry lots of different drug payloads so you can have combination therapies at the same time. So, there's quite a lot of potential there. How do you use nanoparticles to make sensors from gold? One of the primary techniques in the field of nanoparticles is to harness the optical properties of gold. Matthew Millyard from the University of Cambridge uses gold nanoparticles in his work on sensors and he spoke to Kat Arney. Kat - So, tell me a bit about gold nanoparticles. They have quite a rich and to be honest, colourful history. 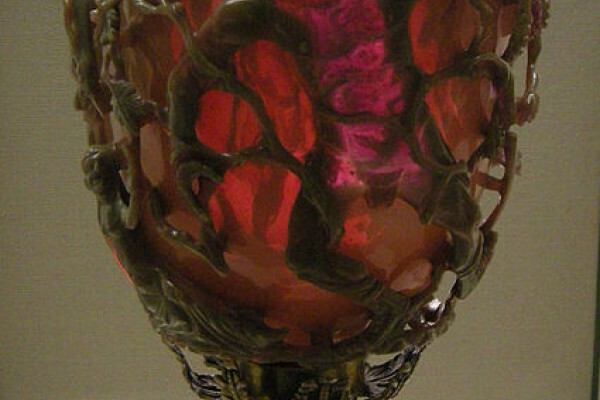 Matt - Yes, so gold nanoparticles have been used in stained glass for examples for almost 2000 years. 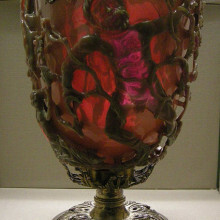 They were actually, first used by the Romans, there's a rather fantastic example in the British Museum called The Lycurgus Cup which looks differently depending on whether you look at light that's reflected on it or light that's transmitted through it. This is because it contains various different gold and silver nanoparticles that absorb and react with light in different ways. Kat - So, tell me about these gold nanoparticles. What sort of sizes are we talking about and what are some of the peculiar properties of them? Matt - So, these gold nanoparticles sit around anywhere between say, 20 nanometres and a couple of hundred nano metres. They are so small that they trap the electrons that usually transport electricity in a bulk gold. And so, when you shine a light onto a nanoparticle, these electrons are moved from side to side of the nanoparticle and this means that each side of the nanoparticle becomes charged. Because of this, the nanoparticle isn't too dissimilar to a magnet. And so, if you bring two nanoparticles close together, there is an enhancement of the electric field between them. If you hold two magnets together you can feel this attractive force. That's because the magnetic field is attracted between the two different charges on each side of the magnet. It's similar with a nanoparticle and this can be used as a kind of magnifying lens for light. So, light gets focused into this gap and it allows us to see what's inside it. Kat - So presumably then this is where the sensors bit comes in because if you've got 2 nanoparticles, you've got a gap in between that you can see through. You can then detect something else that gets in there. Matt - Precisely. So, the idea is that if you shine light on to nanoparticles, they give off a certain colour, but if you put something into the gap, that will change the colour that you see. And so, as a sensor, you can have a look at changes in colour that will result in telling you what is exactly inside your gap. Kat - So, you need to know kind of precisely what effect on the colour this particular chemical has and then you can say, "Right, this is the sensor that detects X molecule." Matt - Yes, precisely. So, it's a very, very slight change that you see in this change of the light that you see. So, you have to have very, very sensitive detectors in order to be able to see what exactly you have in there. But this is a signature of whatever molecule you have in there. So for example, benzene ring which is a ring of 6 carbon atoms gives off a very distinct signature to any other kind of atom. Kat - What kind of things could you detect with these kind of sensors and what sensitivity are we talking about? I mean, there are already some sensors out there that are quite efficient and can go down to quite low levels. Would these be significantly better? Matt - Well potentially, and people have actually achieved single molecular detection with this kind of sensors. So, you'll be looking at just one molecule inside a gap between 2 nanoparticles and you'd be able to know what it is. But practically, what you can do with this is say, looking for contaminants in food. So, there's a research group in Singapore who have recently been looking at rather nasty molecules that can cause all kinds of birth defects in children in orange juice and milk. If they put a piece of contaminated milk onto a sensor made up of these gold nano structures, you can get a detection level significantly better than what Food and Drug Administrations would say is a safe level. So, it becomes a fantastically sensitive way of seeing how many molecules, potentially how many harmful molecules are actually in a solution. Kat - It does sound really exciting, but is it all very expensive when you go to your funders and say, "Yeah, we need to buy loads of gold, sorry."? Matt - When you're making these sensors, you're talking about gold nano particles. They're so minute that you're only using really, really tiny tiny amounts. You're looking less than gold dust in a 20 millilitre solution of gold nanoparticles. So, we really don't have to worry about expense gold. It's more the expense of the manufacturing process. Kat - Where do you want the future of this kind of technology to go? Where do you think briefly, the most exciting things are? Matt - So, the most exciting thing would be because you're only detecting the light that you're given off by these sensors, you could potentially use this within even mobile phone cameras if you had a sensor in front of a camera. You could hold it up to the sun after breathing on it say, and being able to tell if there was anything funny in what you're breathing out. So, any viruses or anything like that. That's probably a bit fantastical, but really, because you're only sensing using light as opposed to anything else, you can get to see some really exciting ideas and applications. 50:04 - Why do deodorants stain some clothes? Do you suffer from white armpit stains? If so, how best to avoid? We sniff out the answer! Next How can I get rid of deodorant stains?